Located in North Western Victoria our quarry customer has been a long time vocal advocate for Kinder Australia conveyor componentry solutions. Major productivity and operational improvements at the quarry have been realised in recent years with the installation of K-Commander® Self Centring Idler to address the on-site belt tracking and excessive material spillage issues. K-MotorShield Motor Covers were also recently installed to the site. Cost savings due to reduced maintenance and extension of motor life were achieved. K-Sure® Support Belt Support Systems installed also delivered on its promise of consistent and stable support at the quarry’s main transfer points. The quarry currently utilising a primary belt cleaner and it was observed by Maintenance Teams particularly during the Winter months that material fines were travelling down the conveyor belt. This residual material or carry back had the tendency to cling onto the belt and accumulate on the return rollers. This common scenario was a leading contributor of potential belt mistracking issues and increased power usage on site. In depth consultations with quarry and Kinder Technical Applications Team were aimed at addressing the important belt cleaning challenges as this greatly impacts the site’s continuous productivity goal. Reducing maintenance and cleaning costs associated with time and resources required to clear/shovel away the material fines on a regular basis was also targeted. For many years, the quarry was operating an incline conveyor system. To implement a reliable and effective cleaning system and overcome the sites ongoing challenges, key factors needed to be taken into consideration, including the hard to reach tail pulley location and tilting nature of the incline conveyor. Maintenance Team were unanimously in favour of installing K-Rotabrush® conveyor belt cleaner, that has the capacity to provide unparalleled cleaning performance primarily where space limitations apply. 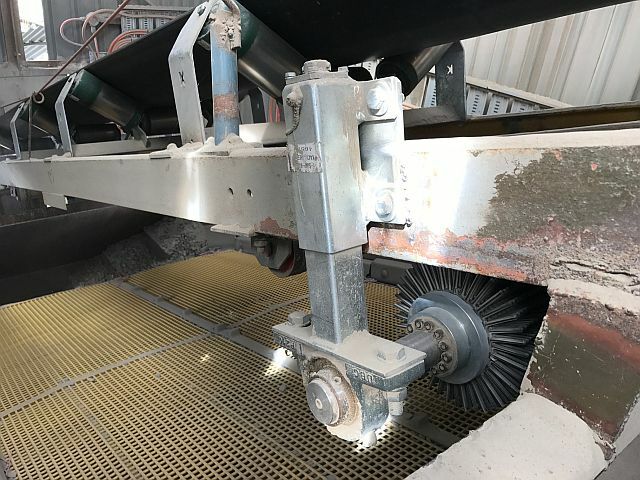 K-Rotabrush® conveyor belt cleaners installed at the quarry, consisted of a rubber brush design and featured a high performance, uniform rotatory action successfully sweeping excessive fines off the belt. This greatly reduced the instances of carry back on the return rollers and helped to stabilise belt tracking, improved conveyor operation and plant efficiency. K-Rotabrush® effectively performed the cleaning action without compromising belt wear and extending its wear life. An external contractor was involved in this simple belt cleaner installation and to date minimal maintenance and virtually no adjustments have been necessary. As well as resolving the ongoing belt cleaning challenges, the quarry was successful in achieving a multitude of improvements and plant efficiencies due to the K-Rotabrush® conveyor belt cleaner installation. Including the immediate elimination of carry back issues and the extension of belt wear life all thanks to correct conveyor belt tracking. Costly cleaning up expenses and the risk of injury has also been significantly averted. Four months into the initial installation, Quarry Maintenance Teams continue to report less production down-time with operators being more efficient, less time involved with manual shovelling of material fines has meant more time to focus on other daily duties. Part of a National building and construction materials group, Kinder is pleased that the Maintenance Team continues to spread their successes achieved to date with other members of the group at training sessions and operational improvement meetings.